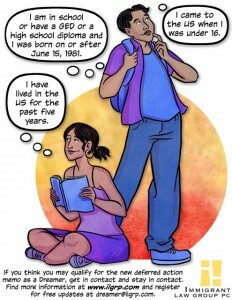 Back to School Checklist – Don’t Forget DACA!! The first day of school is just around the corner. Along with your new pencils, paper and gym shorts, don’t forget to apply for DACA. Some children, who will be turning 15 years old, may qualify as Dreamers or Deferred Action for Childhood Arrivals (“DACA”). ILG has had over 200 DACA approvals and counting! Call our office to see if you or your child will qualify. ILG attorneys would love to talk to you about your DACA case. Find out more here. If you are a school or community organization interested in hosting a DACA workshop click on this link to find out how.